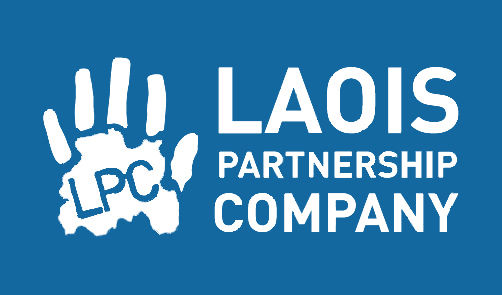 Laois Partnership » Laois Partnership are running a series of Networking Events for the Tourism, Food and Creative Sectors in County Laois. 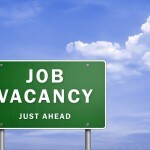 Laois Partnership are running a series of Networking Events for the Tourism, Food and Creative Sectors in County Laois. 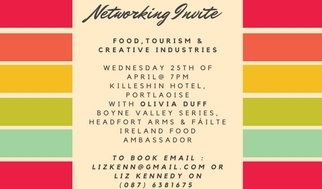 As a follow on to recent Laois Tourism and Food events, Laois Partnership are running a series of Networking Events for the Tourism, Food and Creative Sectors in County Laois. Ian Finnan, Chair Laois Tourism & GM The Killeshin Hotel. Keynote – Olivia Duff : Olivia works with many groups and regions wishing to collaborate in the area of food tourism. Her experience emanates from running The Headfort Arms Hotel & Vanilla Pod Restaurant in Kells, being a food producer at Maperath Farm, Kells with her husband, Olivia is also one of Failte Ireland’s Food Champions and Founder of the Boyne Valley Food Series and Food Network, a group of almost 50 local food centered businesses developing and promoting food tourism in the Boyne Valley region. 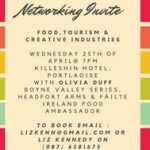 Olivia will give insight to the journey traveled so far by the Boyne Valley Region, branding, financing and the do’s and don’t and the lessons learned along the way in becoming one of Ireland’s best Food Destinations. Representing the 3 sectors of Tourism, Food and Creative, the following businesses will exhibit at the end. A total of 5 networking events will be run and there will be an opportunity for other businesses to showcase their products/services at future events. 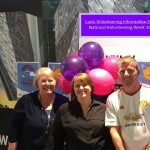 The event is being funded by Laois Partnership and sponsorship has been kindly provided by Laois LEO and The Killeshin Hotel. Booking essential – Places are limited so please RSVP by Wed 18th April to this email: lizkenn@gmail.com or to Liz Kennedy on (087) 6381675.